So, uh, I may have accidentally deleted a bunch of comments from earlier today while dealing with a spam flood. So if you notice a comment you made suddenly having gone missing, it’s not that you were being moderated, it’s that I flubbed. Sorry. You can repost if you like. What’s that? 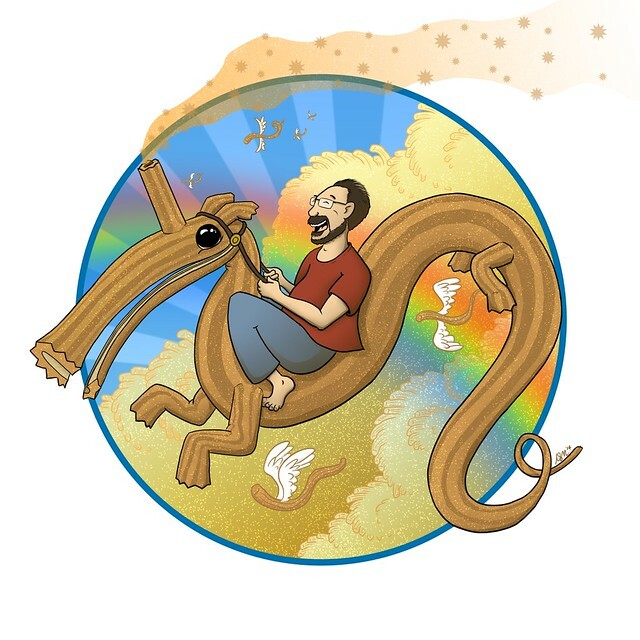 I’m sorry, I can’t hear you over the awesomeness that is me flying on a churrocorn. Yes, when a churro and a unicorn love each other very much, this is what you get. Plus me, flying on my deliciously cinnamon-y steed. This magnificent work of art comes to us from Natalie Metzger, who is clearly a genius. Let her know, here. Check out their fundraising page, and if you think it’s a worthy cause, consider giving them a donation.